World number one Michael van Gerwen suffered a surprise 7-4 defeat by James Wade on the opening night of the 2016 Premier League in Leeds. Van Gerwen went 3-0 up before Wade punished him for missing doubles. With unwell reigning champion Gary Anderson pulling out, debutant Michael Smith played twice, but lost both games to Peter Wright and Adrian Lewis. Raymond van Barneveld beat six-time winner Phil Taylor 7-2, while Dave Chisnall thumped Robert Thornton 7-0. Dutchman Van Gerwen, on the back of his Masters triumph in Milton Keynes on Sunday, took out a 167 finish early on, but then missed doubles in four of the next five legs as Wade, from Aldershot, rattled off five in a row before winning the match on the bull. 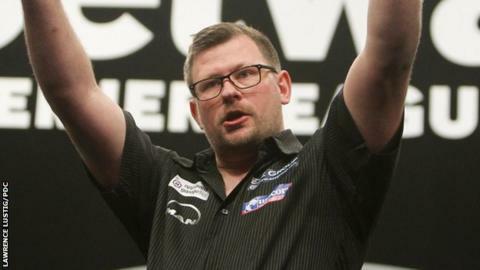 "I'm really happy because there are not many people who will take a point from Michael, because he's the best player in the world," said 2009 Premier League champion Wade. "Michael wasn't at his best and I did enough and hit my finishes when I had to." The tournament will see nine rounds of matches in a league format, before the bottom two drop out of the competition. The remaining eight players then play another six games with the top four qualifying for the play-offs at the O2 Arena in London on Thursday, 19 May.